The Fox tribe of Native Americans are an Algonquian language-speaking group that are now merged with the allied Sauk tribe as the Sac and Fox Nation. The Fox called themselves Meshkwahkihaki, Meskwaki, or Mesquakie. The name Fox originated in a French mistake applying a clan name to the entire tribe, and was perpetuated by the U.S. government. The Meskwaki suffered removal from their ancestral lands, were educated in Christian missionary schools that prohibited the use of their language and religion, and were taught modern methods of farming. Their traditional clan leadership system was replaced by a constitutional government. Yet, today members of the Fox tribe still maintain their tribal identity, practicing traditional crafts and sports, and holding events that continue their traditions and heritage. The Fox or Meskwaki ("The people of red earth") are of Algonquin origin from the Eastern Woodland culture areas. Their language is a dialect of the same larger language spoken by the Sauk and Kickapoo. Meskwaki were called “Renards” (The Fox) by the French—the tribe's first European contact in 1666—but have always identified themselves as “Meskwaki.” The Anishinaabe peoples called the Meskwaki Odagaamii, meaning “people on the other shore,” which the French also adopted as “Outagamie” as a name for the Meskwaki. This name survives today for Outagamie County of Wisconsin. The Fox originally lived east of Michigan along the Saint Lawrence River. The tribe may have numbered as many as 10,000 but years of war with the French-supplied Hurons reduced their numbers and forced them west first to the area between Saginaw Bay and Detroit in Michigan and then to Wisconsin. In Wisconsin, the Fox gained control of the Fox River system. This river was vital for fur trade between French Canada and the interior of North America, because one could navigate from the Bay of Green Bay in Lake Michigan to the Mississippi River. By going down the Fox River to Lake Winnebago, through the Wolf River one could reach a small portage (at the present day city of Portage, Wisconsin) to the Wisconsin River. From the Wisconsin River, traders could reach the Mississippi River and ultimately the rest of the continent. When the French had first contact with them they estimated that the Fox numbered about 6,500. By 1712, they were down to 3,500 when the First Fox War broke out with the French (1712-1714). The Second Fox War of 1728 found the remaining 1,500 Fox reduced to 500, who then found shelter with the Sauk and brought French animosity to that tribe. The First Fox War was purely economic in nature. The French merely wanted rights to use the river system to gain access to the Mississippi. The Second Fox War was almost genocidal because the Fox continually refused to allow traders onto the Fox and Wolf rivers and harassed French settlements along the Mississippi River. French pursuit of the destruction of the Fox tribe was so severe as to damage French relations with other tribes. Members of the Fox tribe spread through southern Wisconsin, and the Iowa-Illinois border. In 1829 the government estimated there were 1500 Fox (along with 5500 Sac). The Black Hawk War was fought in 1832 in the Midwestern United States. The war was named for Black Hawk, a war chief of the Sauk, Fox, and Kickapoo Native Americans, whose British Band fought against the United States Army and militia from Illinois and the Michigan Territory (present-day Wisconsin) for possession of lands in the area. After the Black Hawk War the United States officially combined the two tribes into a single group known as the Sac & Fox confederacy for treaty-making purposes. Then through a series of land cessions under the name of “Sac & Fox” the Sauk and Meskwaki lost all lands and ultimately were removed to a reservation in east central Kansas in 1845 via the Dragoon Trace. Massika, a Sauk Indian, left, and Wakusasse, right, a Fox Indian. 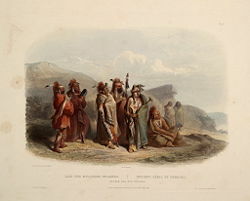 By Karl Bodmer, aquatint made at Saint Louis, Missouri in March or April 1833, when Massika pleaded for the release of Chief Blackhawk after the Black Hawk War. Showing traditional Eastern Woodlands hairstyle of shaved side hair and added deerhair roach. However, some Meskwaki remained hidden in Iowa with others coming back within a few years. In 1856 the state of Iowa enacted a law allowing the Meskwaki to stay. The U.S. government however tried to force the tribe back to the Kansas reservation by withholding treaty-right annuities. In 1857, the Meskwaki purchased the first 80 acres in Tama County. Ten years later, the U.S. finally began paying annuities to the Meskwaki in Iowa, an act that gave the Meskwaki a formal identity as the Sac & Fox of Iowa. The jurisdictional status was unclear since the tribe then had formal federal recognition with eligibility for Bureau of Indian Affairs (BIA) services but also had a continuing relationship with the state of Iowa due to the tribe’s private ownership of land which was held in trust by the governor. For the next 30 years, the Meskwaki were virtually ignored by federal as well as state polices. Subsequently, they lived a more independent lifestyle than other tribes confined to regular reservations that were strictly regimented by federal authority. To resolve this jurisdictional ambiguity, in 1896 the State of Iowa ceded to the federal government all jurisdiction over the Meskwaki. By 1910, there were only about 1,000 Sac and Fox altogether and, even by 2000, their number was less than 4,000. Fox (or Meskwaki) and Sauk are two distinct tribal groups. However, linguistic and cultural similarities between the two tribes have made them often associated throughout history. They speak very similar Algonquian languages, sometimes considered two dialects, rather than two separate languages. The Sauk call themselves Asakiwaki (or Osakiwug) which means "people of the yellow earth" while the Fox call themselves Meshkwahkihawi meaning "people of the red earth." Terminology established by the United States Government continues to treat the Sac and Fox as a single political unit despite their separate identities. The Fox of the eastern woodlands were migratory farmers who lived in summer villages of bark houses, and cabin-style lodges in the winter. They produced wild rice, corn, squash, beans, and tobacco. In the winter when they hunted herds of game, they used portable wigwams. They had three kinds of leader—the war chief, peace chief, and ceremonial chief—each with responsibility for different aspects of life. The war chief was chosen for each campaign based on his battle skills. 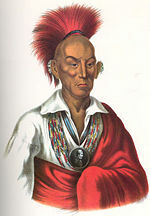 The peace chief was a hereditary position, passed from father to son, and served as the leader of the village council. The ceremonial chief was a shaman, who led the religious rituals. The chiefs smoked sacred pipes, or "calumets," also known as peace pipes although this term is properly only applied when smoked by the peace chief. The pipe was decorated with white feathers when used at a peace council, red feathers at the war council. The Fox used what was called mŭnǐtowǐwi, which was a divine substance that could allegedly animate objects to which it was applied. They held many traditional ceremonies, such as harvest feasts, spiritual and war dances, and equinox and solstice rituals, atypical to many Algonquin tribes. Like most of the regional tribes of the great lakes, the Foxes were polygamists. The Fox were a warlike tribe, described by neighboring tribes as troublesome, thieving, and passionate, and renowned for their courage and bravery in battle. They were proficient craftsmen with both dug-out and birch-bark canoes, which is why their trade industry flourished. Their weapons of choice were spears and clubs. Fox warriors often wore headdresses made out of horsehair which was dyed crimson for effect, and tied to resemble the shape of ancient Roman Helmets. 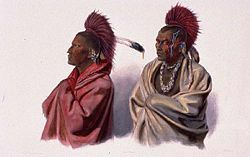 The rest of the head was covered in war paint, and the hair was completely shaved on the sides, and they often bore feathers in their scalplocks. Their upper bodies were often painted, and they wore breeches, moccasins, and leather wraps for leggings. The Sac and Fox Nation is the modern political entity encompassing the historical Sauk and Fox nations of Native Americans. The tribe has multiple separate groups and reservations. The main group, the Sac and Fox of the Mississippi in Oklahoma, moved to near Stroud, Oklahoma in 1869 where they have about 2500 members and an 800 acre (3.2 km²) reservation. A smaller group (called the Sac and Fox of the Mississippi in Iowa, or the Meskwaki Nation) returned to their Iowa lands where they have about 700 members and 4,165 acres (16.854 km² / 6.507 sq mi) in Tama County, Iowa near the city of Tama. There was a resident population of 761 persons on the Sac and Fox/Meskwaki Indian Reservation at the 2000 census. The Sac and Fox Tribe of Missouri separated from the main band in the 1830s and has 360 members and a 61.226 km² (23.639 sq mi) tract in southeastern Richardson County, Nebraska and northeastern Brown County, Kansas, near Falls City, Nebraska. The Sac and Fox Indian Reservation had a resident population of 217 persons at the 2000 census. Although the Fox tribe were removed from their ancestral lands and prohibited from using their native language or practicing their traditional beliefs, contemporary Fox maintain their tribal identity. They practice many traditional crafts and sports, and organize gatherings and events which promote the continuation of their heritage. ↑ Charles E. Cleland, Rites of Conquest: The History and Culture of Michigan's Native Americans (University of Michigan Press, 1992 ISBN 978-0472094479).